(17/P30) TRENTON – The Christie Administration is making $40 million in low-interest loans available to county and municipal governments as well as private owners of dams for projects that will ensure these structures comply with current dam safety standards, Department of Environmental Protection Commissioner Bob Martin announced today. The administration is making $27 million available through the state’s Dam Restoration Loan Program and another $13 million under the state’s Dam Restoration and Inland Water Projects Loan Program. To qualify, a project must be undertaken by a county or municipal government or related agency. Private dam owners are required to have a county or municipal government agree to be a co-applicant. The deadline for applications is May 31. Applications for private dam projects must be accompanied by a letter of interest from a local government unit. Within 90 days, these applicants must secure a resolution from the local government unit committing to being the co-applicant. New Jersey has never experienced a catastrophic dam failure, but has had smaller dam failures over the years. Prior to the 1980s, there were no uniform national standards for dam design and construction. 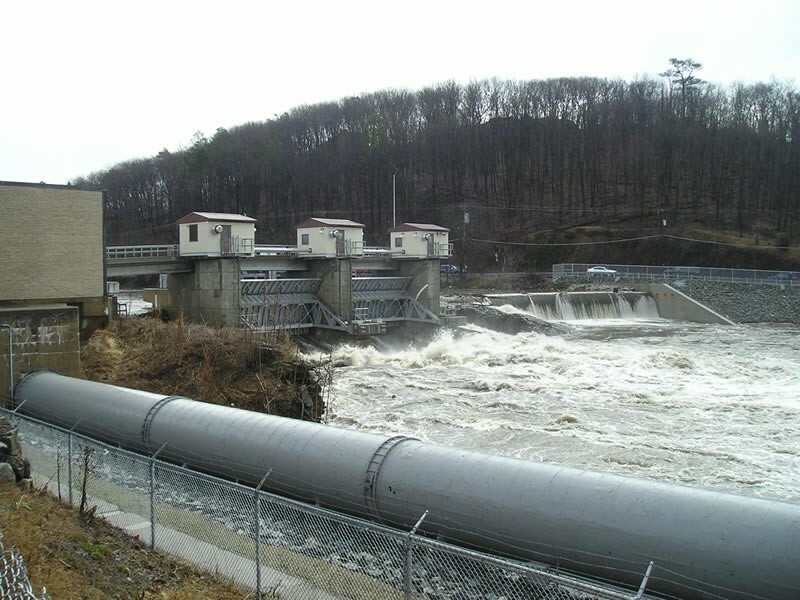 In New Jersey, dams built before then were designed to handle the record rainfall that occurred within the watershed where the dam was located. The Army Corps of Engineers developed new standards following the 1977 failure of the Kelly Barnes Dam near Taccoa, Ga.
New Jersey in 1985 promulgated new standards to ensure the integrity of dams for the protection of lives and property. Voters also subsequently passed bond referendums to ensure a stable source of funding for dam rehabilitation projects. The loans being made available now are to assist owners of significant- and high-hazard dams that are rated as being in “fair” or “poor” condition. Loans will be provided to rehabilitate dam spillways so that they can handle the worst-case storm scenario, known as probable maximum precipitation. A spillway is the portion of the dam that allows for passage of water during normal and storm conditions. The DEP requires that these dams be inspected every two years - annually for larger dams - and that measures are taken to ensure their safety. Bringing them up to current design standards usually requires a combination of modifications to the spillway and/or raising or “armoring” the earthen embankments that typically flank spillways. Armoring can include placement of roller-compacted concrete or pouring of concrete to ensure that embankments do not wash away and collapse in the event of overtopping. The provision requiring county or municipal governments to be a co-applicant for private projects enables the respective governing body to levy taxes on owners should they default on the loan. The loans are made available periodically as funding becomes available as a result of repayment of previous loans. The funding comes from bond acts previously approved by voters. Over the years, the DEP has provided nearly $152 million in funding under the two bond programs. The last round of funding occurred in 2012. The DEP is making all $40 million in funding available for dam-related projects. However, should the department get insufficient applications for dams, a portion of the money will be used for inland waterway projects such as dredging, flood control and stream restoration. There are four classifications of dams in New Jersey related to potential for property damage and/or loss of life should the dam fail. The failure of a Class I high-hazard potential dam my result in the loss of life and/or extensive property damage. The failure of a Class II significant-hazard potential dam may result in significant property damage but loss of life is not envisioned. The failure of Class III or smaller Class IV low-hazard potential dams is not expected to result in loss of life or significant property damage.